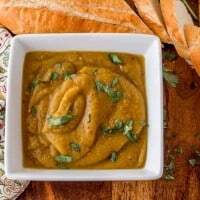 Beneath the skin of the formidable-looking turban squash lies a fine textured, sweet flesh that is just perfect for comforting winter soups like this Roasted Turban Squash Soup With Pear and Sweet Onion! Indian spices and coconut milk enhance the flavor of the soup… and, it’s gluten free, dairy free, and delicious! I am generally not one to shy away from trying new ingredients. However, the turban squash intimidated me from the first time I spotted one on the upper shelf at my market a few years ago… My local McAllen HEB stocks an amazing variety of produce, and I have ignored them calling my name since last fall. It was time to take the plunge, so I purchased my first turban squash. What do you think? It’s so pretty, isn’t it? The process of cooking it is really pretty simple. You’ll need a good heavy knife, and a good solid cutting surface. Cut the squash across the top, then insert the knife point through the middle and all the way to the cutting board. Then, bring the knife down to horizontal on both sides. I am working on a video to include in this post, and will include it as soon as I’ve got it finished! To make the soup, remove the seeds and pulp, then brush the squash halves with coconut or olive oil. Roast them with the onion and pear. The squash will need to cool before you can scoop the tender flesh from the skin. While the squash cools, start the soup in a dutch oven. Fry the garlic, ginger, and black mustard seeds. Add the broth/stock, the squash, pear, and onion. Simmer 10 minutes, then using an immersion blender (invaluable kitchen tool), purée it. Lastly, the coconut milk and coconut creamer are stirred in, and don’t forget to taste for seasoning! 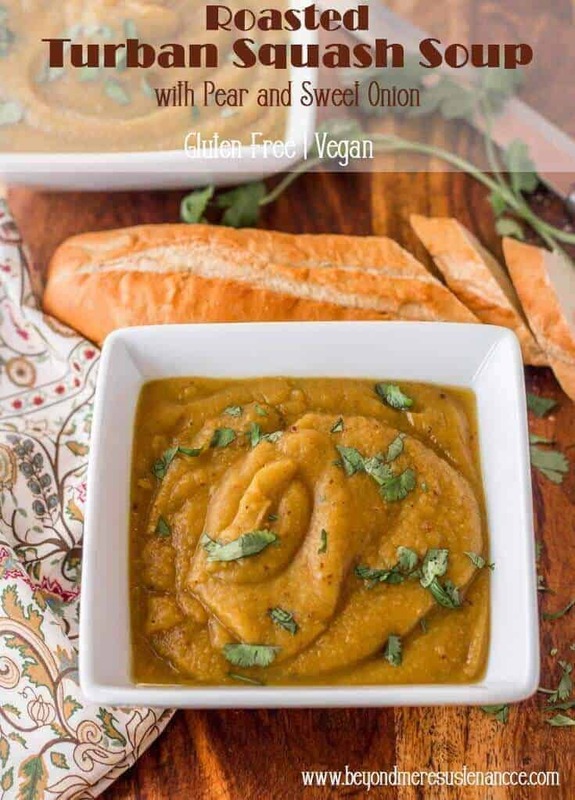 Garnish this gluten free and dairy free soup with a bit of chopped cilantro. 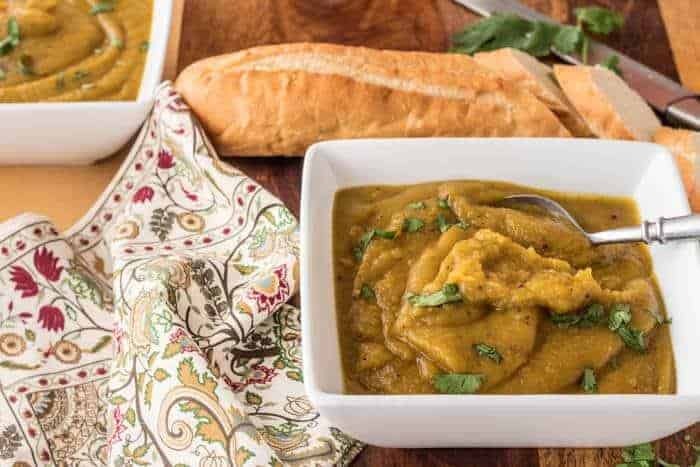 This hearty soup makes a nice light supper (especially served with naan or roti), but would also be a lovely first course for a more substantial meal… Thanksgiving perhaps? 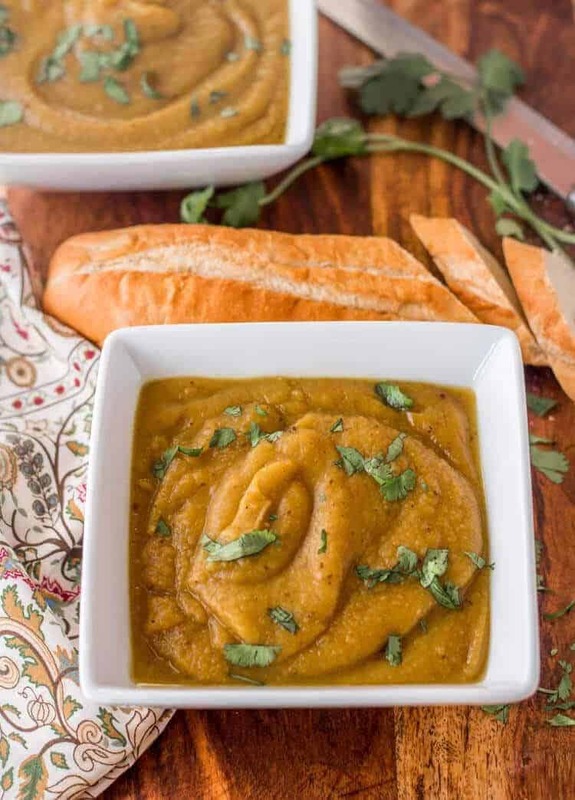 Flavorful and sweet turban squash get roasted with pear and sweet onion, then combined with Indian curry spices and coconut milk in a healthy and creamy soup! 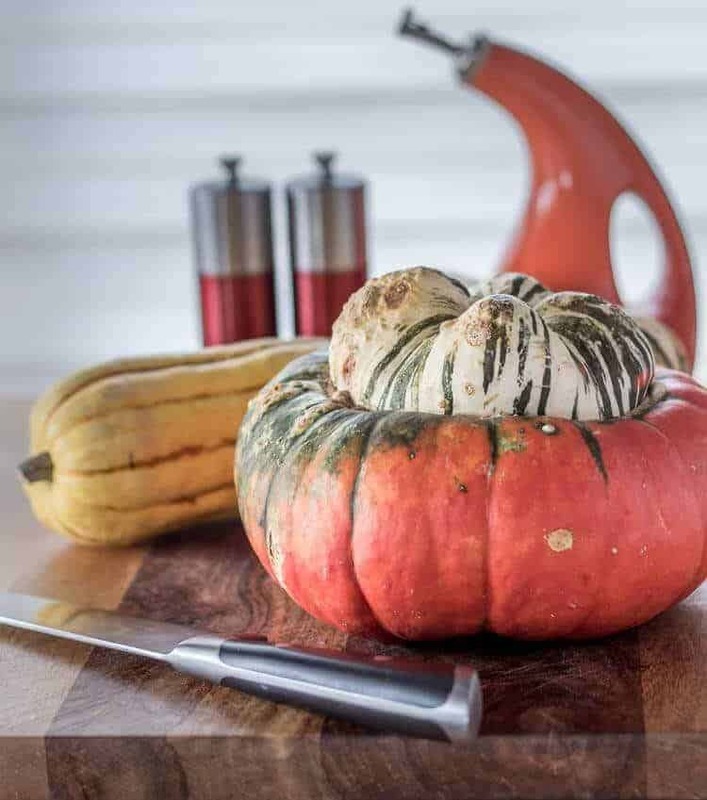 Cut the turban squash in half, and using a thick spoon, remove the seeds and pulp. Brush with coconut or olive oil. Place skin side down on baking sheet. Brush the sweet onion wedges and potato with oil. Place on the baking sheet with the squash. Set timer for 15 minutes. Add the quartered pear. Roast until squash is tender (about 40-45 minutes total). While the squash cools to where it can be handled, start the soup. To a dutch oven, add a drizzle of coconut or olive oil. Bring the pan to medium-high heat. Add the ginger and garlic. Stir-fry until the mixture is fragrant. Add the black mustard seeds. Continue until the seeds begin to pop. Pour in the broth. Scoop the flesh from the squash leaving the skin behind. Add to the dutch oven with the roasted pear and onion. Add the garam masala and turmeric. Add the coconut milk and coconut creamer. Stir to combine. Season with sea salt and ground pepper to taste. Bring the soup barely to a simmer. Do NOT BOIL. Macronutrients (approximation from MyFitnessPal): 248 calories; 3 g protein; 33 g carbohydrates; 10 g fat. Thanks Beth! That's a great idea! I can see the appeal for sure... I like roasting because of the additional flavor I get with the roasting (maillard reaction). However, it is a big of work... It's nice to know there's another way. I appreciate the feedback! I've never tried a turban squash, but they are really stunning! And I love all the flavors here, especially the pear! I love squash because each one is unique. The shape, the colours.... And every year or so we Brits seem to get a new variety hit the shelves - they are catching on over here. I've yet to spot a Turban Squash, but I won't give up home quite yet. Your flavours sound delicious and thanks for sharing your squash prep secret weapons. It is very common in the US. It may be a matter of growing conditions that the UK does not have. You did a great job explaining how to deconstruct that beautiful squash Tamara and your soup looks amazing! Thanks Julie! I hope people realize the benefit of this squash... It's so tasty and nutritious!